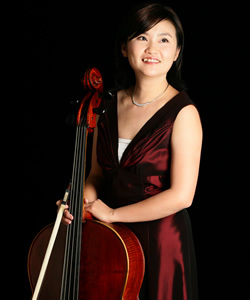 LIU Chu Chuan is one of the last pupils of the great Austrian cellist Senta Benesh at the Hochschule fur Musik und Darstellende Kunst Wien (Vienna), and received her artist diploma from Konservatorium d. Stadt Wien with highest honor(Auszeichnung). During the time in Europe she has also performed in master classes for several renowned cellists: Michel Strauss (Paris), Heidi Litchauer (Salzburg), Christopher Henkel (Freiburg) among others, and for a short period of time, studied Viola da Gamba with Jose Vasquez and participated in chamber music seminars lead by the Wiener Schubert Trio. In 1993 LIU went on to study with Stephen Kates at the Peabody Institute on a scholarship. As member of the Peabody Camerata , she then returned to Europe to perform under the baton of Maestro Rostropovich at the festival of Evian, France in 1994. She was awarded ”Young Musician of the Year” by the cultural minister as she went back to Taiwan in 1995, and started giving concerts both as solo and chamber cellist. Once a very enthusiastic performer for contemporary music, she has appeared with CCOT (Contemporary Chamber Orchestra Taipei) in music festivals in New York, Boston, Vancouver, Shanghai, and gave world premieres for solo works by Asian and European composers alike. LIU Chu-Chuna is cellist of the Po-Ya Piano trio and has been invited to collaborate with chamber music society of Minnesota and cellist Alexander Rudin, violinist Chao-Liang Lin, pianist Ching-Yung Hu at their chamber concerts in Taiwan. Currently associate professor at the Taipei National University of the Arts – a forefront institution of its kind in Asia, LIU is also founder and artistic director of CCliu’s Cello Ensemble.